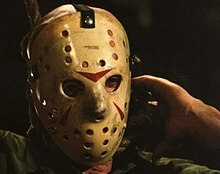 Jason Voorhees wearing the now-iconic goalie mask. It was made by being molded from a Detroit Red Wings 00. It would become a staple for the character for the rest of the Friday the 13th series, and had an instant impact on pop culture. The first goaltender mask was a metal fencing mask donned in February 1927 by Queen's University netminder Elizabeth Graham, mainly to protect her teeth. In 1930, the first crude leather model of the mask (actually an American football "nose-guard") was worn by Clint Benedict to protect his broken nose. After recovering from the injury, he abandoned the mask, never wearing one again in his career. At the 1936 Winter Olympics, Teiji Honma wore a crude mask, similar to the one worn by baseball catchers. The mask was made of leather, and had a wire cage which protected the face, as well as Honma's large circular glasses. It was not until 1959 that a goaltender wore a mask full-time. On November 1, 1959, in the first period of a game between the Montreal Canadiens and New York Rangers of the National Hockey League (NHL) at Madison Square Garden, Canadiens goaltender Jacques Plante was struck in the face by a shot from Andy Bathgate. Plante had previously worn his mask in practice, but head coach Toe Blake refused to allow him to wear it in a game, fearing it would inhibit his vision. After being stitched up, Plante gave Blake an ultimatum, refusing to go back out onto the ice without the mask, to which Blake obliged not wanting to forfeit the game since NHL teams did not have back-up goaltenders at the time. Montreal won the game 3–1 and continued on an 18-game unbeaten streak, which went through November. In preparation for the playoffs, Plante was asked by Blake to remove it for a game on March 8, a 3–0 loss. Plante donned the mask the next night, and for the remainder of his career. When he introduced the mask into the NHL, many questioned his dedication and bravery; in response, Plante made an analogy to a person skydiving without a parachute. Although Plante faced some laughter, the face-hugging fiberglass goaltender mask soon became the standard; by late 1969, only a few NHL goaltenders went without one. Since the invention of the fiberglass hockey mask, professional goaltenders no longer play without a mask. The last goaltender to play without a mask was Andy Brown, who played his last NHL game in 1974. He would then go to the Indianapolis Racers of the World Hockey Association and play without a mask till his retirement in 1977. The face-hugging fiberglass, the type which was worn first by Jacques Plante, is a longtime symbol of ice hockey as typified by the famous painting At the Crease, by Ken Danby. The goaltender mask evolved further from the original face-hugging fiberglass mask designed by Plante. Although this mask does not seem very protective now, at the time it was, based on the style of game that was played. Gerry Cheevers' use of the face-hugging mask for the Boston Bruins was among the first to be "decorated" in a custom manner; as prompted by then-Bruins trainer John "Frosty" Forristall as a joke, painting on a fake stitch where Cheevers had been struck in the mask by an errant puck on the mask. 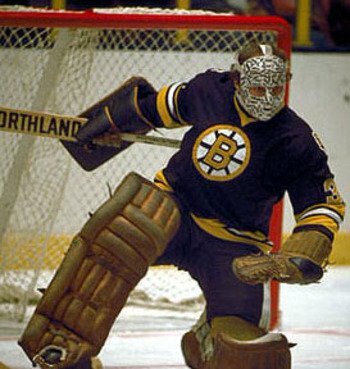 Cheevers adopted the "stitch mask" as his own, and went on to set a NHL record (which still stands) of 32-straight wins during the Bruins' 1971–72 season. This style of mask is no longer used by hockey leagues, yet its fame continues because of its use by horror movie icon Jason Voorhees of the Friday the 13th film series. Casey Jones of the Teenage Mutant Ninja Turtles franchise also wears a stylized version of the mask, as did D-Roc the Executioner, the late guitarist of the heavy metal band Body Count. Similarly, the members of Hollywood Undead are always seen wearing signature masks based on this design. The robbers in Heat and Grand Theft Auto: Vice City also wore face-hugging hockey masks as part of their disguise during a heist. In the 1970s, a helmet/cage combination became popular, which was popularized by Vladislav Tretiak, the noted Russian goaltender who competed against Canada in the 1972 Summit Series and against the USA in the 1980 winter Olympics known as the "Miracle On Ice". Like the original fiberglass design, the helmet/cage combination has been criticized for not providing adequate facial/cranial protection. Dan Cloutier switched from this type of mask to the more popular full fiberglass citing safety reasons upon the advice of the Los Angeles Kings. Dominik Hašek, a Hart Memorial Trophy and Vezina Trophy-winner in the late 1990s, used this type of mask; Hašek retired from the NHL in 2008. Rick DiPietro, last with the New York Islanders in 2013, was one of the last NHL goaltenders to use this type of mask. Following Clint Malarchuk's life threatening injury in 1989, more goaltender masks have adopted a plastic extension to guard the neck, usually hanging loose for more maneuverability. On March 4, 2014, Tim Thomas took the ice for the Florida Panthers wearing an old Cooper helmet painted dark blue with a modern Bauer cage and white Itech neck guard attached. During the game, the cage would break from a slapshot and Thomas would return with a red Mage-style helmet with a similar Bauer cage. Goaltenders at lower levels of hockey (such as high-school, college or recreational leagues) who choose to use this design cite reasons such as the plastic helmet used is lighter than the fiberglass or composite materials used in other designs, and that the helmet has a wider opening than a traditional mask for a less claustrophobic feeling and better sight of the puck. The cage/helmet combo mask, worn by Dominik Hašek. A standard (typical) full fiberglass/Kevlar mask, as worn by Martin Gerber. The second type of goaltender mask is a fiberglass mask with a cage attached in the middle. It can also be made out of carbon fiber, or a fiberglass and kevlar mix. These masks are able to better withstand the impacts of hockey puck at higher speeds and are used at all levels of organized ice hockey. These masks are considered safer since they disperse the impact of the puck better than the helmet/cage combination. Former goaltender Tim Thomas of the Boston Bruins wore a newer style one piece called a Sportmask Mage RS, which is made like the newer fiberglass mask, but resembles the helmet/cage combination. The advent of the goaltender mask changed the way goaltenders play, allowing them to make more saves on their knees without fear of serious head or facial injuries. Before the advent of the mask, most goaltenders stayed standing as much as possible. In the modern era, a goaltender is likely to make the majority of saves when they have one or both knees on the ice. With the technological advancement of the mask, shots hitting the head typically only cause temporary discomfort instead of serious concussions and lacerations; however, a mask does not eliminate all potential risk of injury, and goaltenders have been concussed by a shot hitting the head. Some goaltenders, like Dominik Hašek and Henrik Lundqvist, have used their heads intentionally to stop shots. Lundqvist said that his reason for this is to not obstruct his vision by placing his catching glove in front of his mask to stop the shot. With the available surface area provided by fiberglass masks, goaltenders find it fashionable to give their mask distinctive decorations. This tradition started with the earliest masks, notably by the aforementioned, now-retired Boston Bruins goaltender Gerry Cheevers, who was known for drawing stitches on his mask whenever it got hit. These stitches represented where Cheevers would have been cut had he not been wearing his mask. Modern-day masks also offer this ability, and goaltenders are well-identified with their helmet design, often transferring the motif into their new team's colours when traded or signed to a new team (for example, Patrick Lalime's Marvin the Martian theme, Félix Potvin's cat theme, Curtis Joseph's Cujo theme, Ed Belfour's eagle theme, Martin Brodeur's Devils theme, Peter Budaj's Ned Flanders theme, Cam Talbot's Ghostbusters theme or John Gibson's Arcade game theme). Henrik Lundqvist's mask featuring the Statue of Liberty. Marc-André Fleury's mask celebrating the Penguins 2009 Stanley Cup win. Leafs goaltender James Reimer's "Optimus Prime" themed mask. Brent Johnson's mask featuring Led Zeppelin graphics and lyrics. A baseball catcher wearing a mask modeled after the goaltender mask. In recent years, baseball catchers have begun wearing facemasks similar in style to goaltender masks. Charlie O'Brien was the first to use a hockey-style catcher's mask in a Major League Baseball game in 1996 while playing for the Toronto Blue Jays. Goaltender masks are commonly seen being worn by box lacrosse, ringette, rinkball, floorball and field hockey goaltenders at both youth and professional levels. ^ a b "Masks for goalies gain acceptance". Spokesman-Review. (Spokane, Washington). Associated Press. November 23, 1969. p. 7, sports. ^ "History of Masks". Retrieved 2007-06-17. ^ "Plante hurt, finishes up with mask". Montreal Gazette. Associated Press. November 2, 1959. p. 21. ^ "Jacques Plante to wear mask against Rangers tonight". Montreal Gazette. November 5, 1959. p. 26. ^ "Leafs beat Habs 1-0, end streak". Montreal Gazette. Canadian Press. December 3, 1959. p. 25. ^ "Plante removes mask, Canadiens lose to Red Wings 3-0". Montreal Gazette. Associated Press. March 9, 1960. p. 25. ^ "Habs whip Leafs 9-4". Montreal Gazette. Canadian Press. March 10, 1960. p. 27. ^ "Andrew Conrad (Andy) Brown". Retrieved 2007-06-17. ^ "Cheevers with the "stitch mask" on, in a Bruins game". Archived from the original on 2017-11-07. Retrieved 2017-11-01. ^ O'Reilly, Terry (5 January 2017). "The Crazy World of Trademarks". Under the Influence. CBC Radio. Canadian Broadcasting Corporation. Retrieved 7 January 2017. ^ McLaren, Ian (March 19, 2014). "This Day in Hockey History". The Score. Retrieved March 24, 2014. ^ "Bruins Keep Rolling". The New York Times. February 14, 1983. Retrieved March 2, 2014. ^ "Jason Voorhees figurehead". Retrieved 2007-06-17. ^ Devenish, Colin (August 19, 2004). "Body Count Guitarist Dead". Rolling Stone. Retrieved 2007-08-24. ^ "The Goalie Mask". NHL.com. Retrieved 16 March 2017. ^ "Panthers' Tim Thomas shows off a pair of odd helmets in game vs. Boston". SI.com. 5 March 2014. Retrieved 16 March 2017. ^ "Gerry Cheevers". Retrieved 2007-06-17. ^ "Gerry Cheevers Biography". Archived from the original on 2007-09-29. Retrieved 2007-06-17. ^ "About Charlie O'Brien". charlieoproducts.com. Retrieved 16 March 2017. Wikimedia Commons has media related to Ice hockey goaltender helmets.